Antoniazzo Romano (Antonio Aquilio) was a pupil of Benozzo Gozzoli, mainly active in Rome. 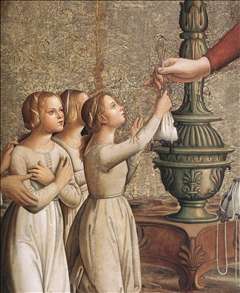 He was a painter from the Colonna rione (quarter) of Rome who worked in the city for more than forty years and whose figurative style was enriched over the years by Umbrian ( Perugino, Melozzo da Forli) and Florentine ( Domenico Ghirlandaio, and Fra Angelico) influences. Antoniazzo s importance as an entrepreneur was evidently considerable: he made it his business to associate with painters not yet well-known in Rome, guaranteeing them major commissions, which he was able to obtain to his contacts with patrons. This position was confirmed when in 1478 he became the head of the guild of painters and illuminators of Rome. It was Antoniazzo who revised the guild s statutes. 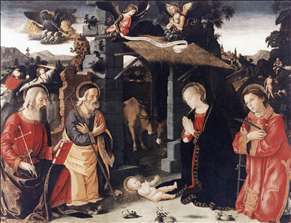 The first mention of a work by Antoniazzo is in 1464, the year he was commissioned to decorate the funerary chapel of Cardinal Bessarion in the church of Santi Apostoli, completed in 1467. In the centre of the decoration was an icon of the Virgin, now in the Chapel of St Anthony, a copy of the Byzantine icon in the Santa Maria in Cosmedin, the church of the Greeks in Rome. This icon in the Santi Apostoli is one of the most remarkable examples of Antoniazzo s considerable production of Virgins, generally taken from Byzantine models. Antoniazzo was a much sought-after copier of icons. In 1466 he participated in the decoration of the public rooms of Palazzo San Marco (now Palazzo di Venezia). 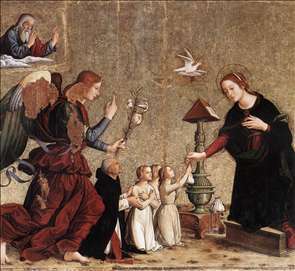 In the years between 1475 and 1480 Antoniazzo s production of altarpieces and panels with images of the Virgin increased as a result of the encouragement of the cult of the Virgin by Sixtus IV. 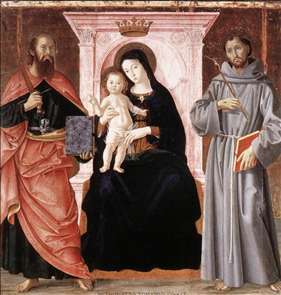 Antoniazzo Romano was an important figure in 15th-century Roman painting. See more details about "Madonna Enthroned with the Infant Christ and Saints"
See more details about "Nativity with Sts Lawrence and Andrew"